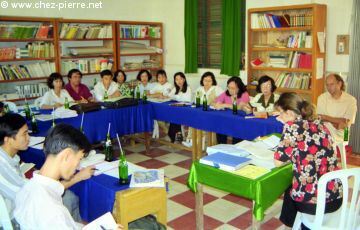 In October, 1997 I was hired by the APEFE and the AUPELF-UREF as educational adviser for the Vietnamese teachers in the "Bilingual Classes" project (505 classes in 97-98). Vietnam, one of the first members of the French-speaking world, indeed wants to strengthen its programs of foreign language teaching. 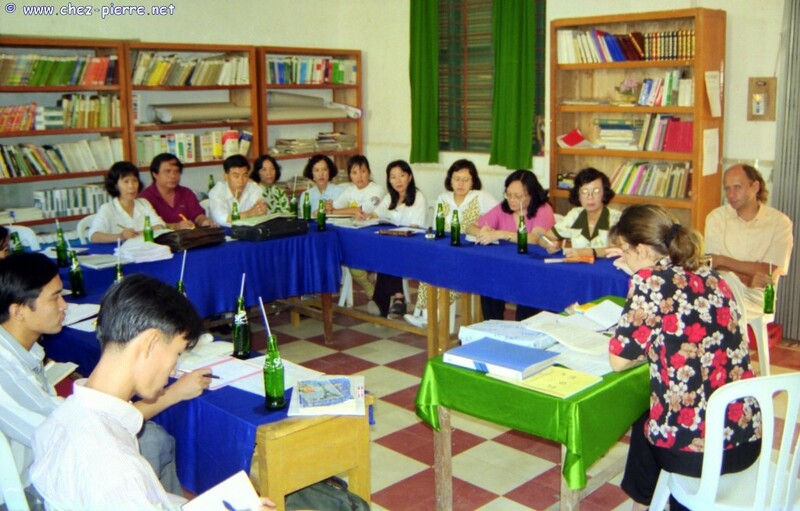 So in 1994 the Ministry of Education officialized the bilingual classes, small experimental program launched in 1992 in Ho Chi Minh City by Hervé Fayet, nationalizing it with the help of the AUPELF-UREF (which later became the AUF). This new departure is an important step for me, because it gives me the occasion to share with the other teachers the experience I acquired as a schoolteacher and as professor of FFL / FSL (French as a Foreign Language / Second Language). 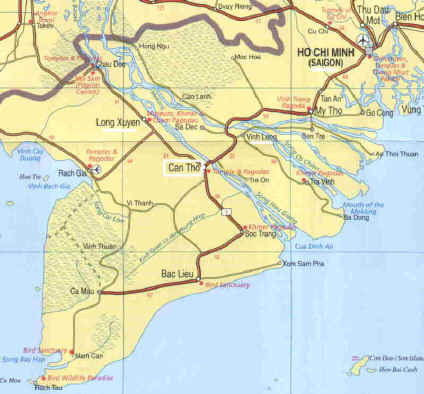 I was at first in charge of Can Tho's region (South of Ho Chi Minh City) with periodic missions to Vinh Long. 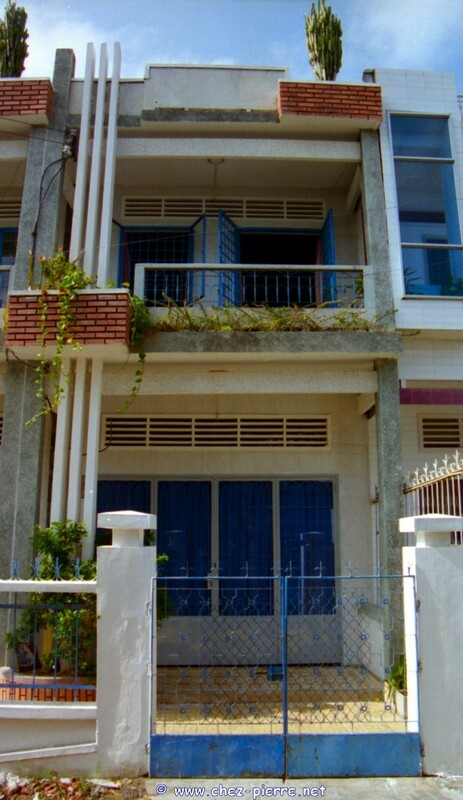 Two years later, I moved in Hanoi, then from 2000 till 2002 I lived and worked in Ha Long (Along's bay). OK, I understood the message... Last preparations in a panic, hasty good-byes and I jump into the plane to Hanoi. Jean-Pierre Outers, spokesman for the APEFE, waits for me with a rental car (what a luxury !) First contact with the traffic in Viet Nam : WOW ! At the hotel, small meeting and I'm given a big file - already ! - Jean-Pierre orders a car for me at... 4:00 am, to go catch the plane for Huê where I am impatiently waited for ! So I quickly go to bed, get up at 3:00 am, and arrive in Huê around 8:00. But at the moment, we are also in charge of Huê's "World congress of the Education of and in French" which begins tomorrow and for which we're asked to help for the organization. After all, there are 280 guests from the 49 countries of the French-speaking world arriving, among whom around thirty Ministers... We did celebrate my birthday anyway, on Sunday the 19th at 11:00 pm in the hotel lobby : simple, but good ! No time to rest, as soon as the Congress closed I was back on the plane, for Saigon this time. Vietnam piece by piece... Hervé Fayet (responsible for the Bilingual Classes in the South, super-nice and effective) welcomes me at the airport, from where we go directly to his office for... A meeting of course. In the evening, finally, a nice small hotel, a shower ! During the 5 following days, we worked a little more calmly, and I began to assume my jet lag, bit by bit. Some shopping and some evenings out, a rather good moment as a matter of fact, even if was getting tired of living in my suitcases. Departure towards Can Tho at 7:00 am with Hervé, Nadine (educational adviser whom I am going to replace and who is going back to get her stuff) and my suitcases and trunks. Six hours driving for 168 km, not really a track, but a very frequented road (motorcycles...), very dangerous, and cut by two ferries to wait for...a long time. Meeting at the Service of Education to present me, then visits to the seven schools for which I am responsible in Can Tho. 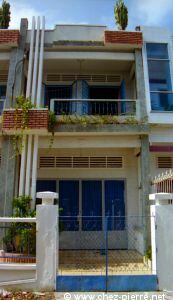 Later, I'll visit both schools for which I am responsible in Vinh Long, the nearby province. I am already surprised, during these first visits, seeing the capacities of the pupils to understand and to express themselves in French... It's only the beginning. Dive in the bath ! The next day, while Hervé leaves for Saigon and while Nadine prepares her luggage, I lead my first educational meetings (weeklies). From 7:00 am till 11:00, the 15 secondary teachers. From 2:00 pm till 4:30, the 15 primary teachers. From 5:30 pm till 7:30, the 6 Science teachers. An educational meeting, here animated at the secondary level by Mariane Capouet, my colleague of Dalat who came visiting ; with the presence of Michel Le Gall, Cultural attaché of the Embassy of France. In short, I told them about my way of working and we established my visits schedule for the next weeks : first week, all the primary classes (22) and the next week all the secondary classes and the science teachers (18+6=24). Then ? Another round of the same... Score of the first month : 97 visits and individual meetings ! The next day, on Friday, I moved my stuff at Nadine's and met the owner. The house was not really convenient for me yet : no panes in windows, no air-conditioner of course, no warm water, "Turkish" toilet, and walls (painted in blue) very dirty and damaged (not mentionning the front door, an old acrid iron curtain). Well, with age (hem!) one wants his little comfort ! The owner agreed to improve all this for an increase of the rent. November 15 : "Home" ! I spare you the story of my baptism (the cyclone Lynda passed by during my first WE in Can Tho) and other events like this.